After the sickening thought that too many summer blockbusters had caused CC's brain to ooze out the ears, we took in the well-reviewed indie I Capture The Castle. We were pleasantly surprised that well-drawn young women characters still inhabit the silver screen and even more pleased that CC can still appreciate them, thoughtfully and with big words like effervescent (as in star, Romola Garai's irrepressible personality) and tremulous (to describe her character, Cassandra's tenderly blossoming womanhood). 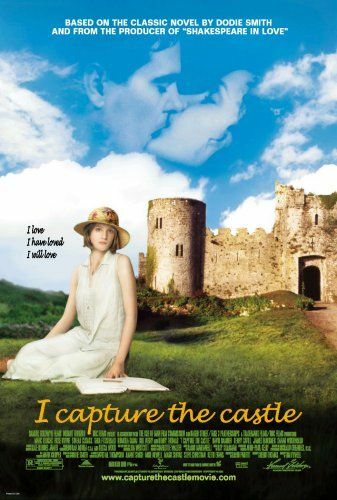 Like a good Jane Austen novel, Cassandra (coincidentally, the name of Jane's beloved sister) lives with her elder sister, Rose and their penniless but creative family in a remote castle in Southern England and spend their days rambling the picturesque country and fearing that they'll never marry. Although, instead of it being the late 18th century, the Mortmain family live in the relatively liberated 1930s where they can talk about assignations in the British museum's mummy room and how father's writing talent may be all dried up. To break the monotony, two young men, brothers (Marc Blucas of Buffy fame and Henry Thomas the ET kid all grown up), the eldest who's inherited the estate on which the Mortmain's live, arrive and the girls get caught up in finagling a proposal from the eldest, Simon (Thomas) for Rose. See, it's all very Jane. What makes this film so lovely and engaging though, is that these characters don't really stand on the ceremony so characteristic of Austen's drawing room farces. They're real girls with fears, fantasies and dreams and as Cassandra records her thoughts in her journal, we get the honest portrayal of a young woman's emotional and sexual awakening reminiscient of Anne Frank (without the Holocaust) or Bridget Jones (without the bitter). Much of this rests on the charm of Garai, who's set to star in Dirty Dancing: Havana Nights later this year with one of the hot guys from Y Tu Mama Tambien. Let's hope this is her Man In the Moon and we're witnessing the birth of a new Reese, not the beginning of a career in purely teen fare ala a Kirstin Dunst. After the credits began to roll, and a few of the young women around me tried to dry their eyes (the end is quite moving), this crazy woman asked a person near her, "what happened at the beginning of the movie?" A bunch of us laughed, partly at the absurdity of being late to the movies and not being able to figure out the set up. But also at the way I Capture The Castle had brought us on a journey, like the best movies do, and to try to explain the beginning at the end is entirely ridiculous. Guess that lady'll just have to pay to see it again.